Home Liabilities What is a Liability, Examples, Types, its Placement, etc? In a business scenario, a liability is an obligation payable to a third party. It may or may not be a legal obligation and arises from transactions and events occurred in the past. It is usually payable to an external party (e.g. lenders, long-term loans). There are mainly three types of liabilities except for internal liabilities. Current liabilities, Non-Current liabilities & Contingent Liabilities are the three main types of liabilities. The settlement of a liability is expected to result in an outflow of funds from the company. Total Liabilities are always equal to the Total Assets. While dealing with a liability account it is important to know that it would always carry a credit balance. As per the modern classification of accounts or American or Modern Rules of accounting an increase in liability is credited whereas a decrease is debited. 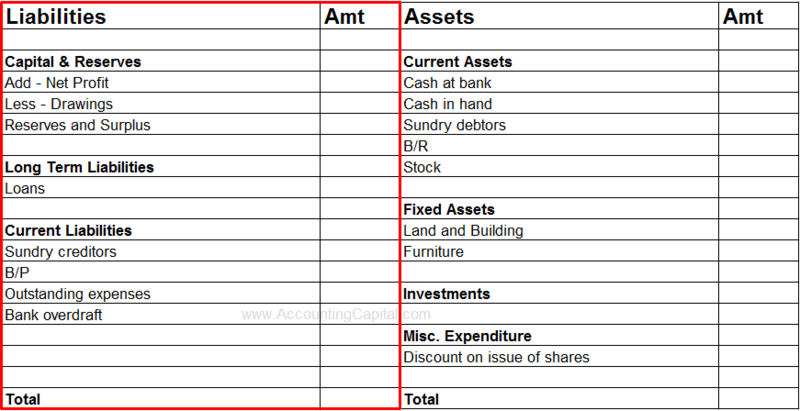 Liabilities are shown on the left-hand side of a vertical balance sheet. They would always equal to the assets of a company. 1. Current Liabilities – Also known as short-term liabilities they are payable within 12 months or within the operating cycle of a business. Examples – trade creditors, Bills payable, outstanding expenses, bank overdraft etc. 2. Non-current Liabilities – Also termed as fixed liabilities they are long-term obligations and the business is not liable to pay these within 12 months. Examples – long-term loans, bonds payable, debentures, etc. 4. Owner’s funds/Capital/Equity – Last among types of liabilities is the amount owed to proprietors as capital, it is also called owner’s equity or equity. Internal – It is payable to internal parties such as promoters (owners), employees etc. Example – Capital, Salaries, Accumulated profits, etc. External – It is payable to external parties such as lenders, vendors, etc. Example – Borrowings, Creditors, Taxes, Overdraft, etc.